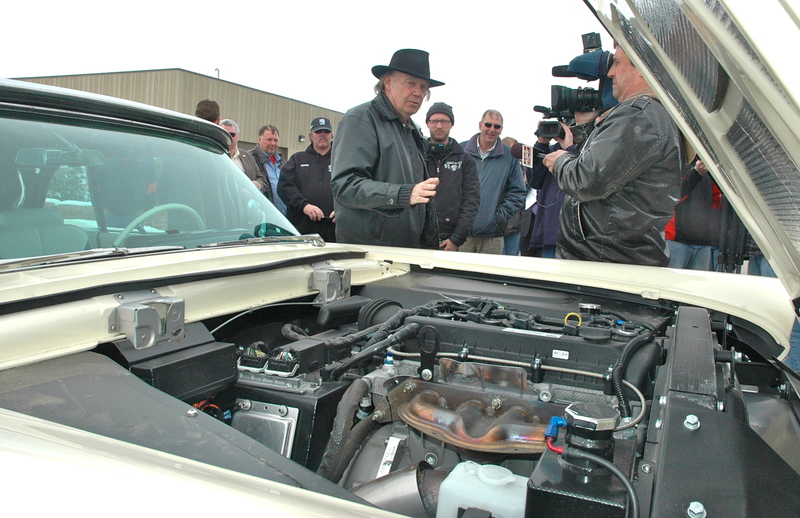 Singer, songwriter and Rock and Roll Hall of Famer Neil Young made a brief stop in Sioux Falls at POET last Friday afternoon to fill his 1959 LincVolt with South Dakota ethanol as he and his crew travel across the country making a documentary about reducing America’s dependence on oil. Young is passionate about finding ways to protect the environment, which is why he altered his 1959 Lincoln, a car he has owned for nearly two decades, by replacing the vintage gasoline-guzzling motor with an electric hybrid engine that runs on E85 (a blend of 85% ethanol, 15% gasoline). When Young was asked why ethanol, the better question would have been why not? “It’s a fuel made by Americans, in America, that is cleaner than fossil fuels,” Young said. The amazing efficiency isn’t all that he and his team are proud of as he touted the car’s huge reduction in carbon emissions thanks to ethanol. And yes, they have an app for that which calculates their mileage and emissions as they travel from Young’s home in California to Washington, DC as he hopes to eventually visit with U.S. Secretary of Energy Steven Chu. This entry was posted in News and tagged carbon, ethanol, LincVolt, Neil Young, Sioux Falls, South Dakota.